Click below to view some images from one of Little Judah's first days home. So much love and excitement had this home bursting at the seams! 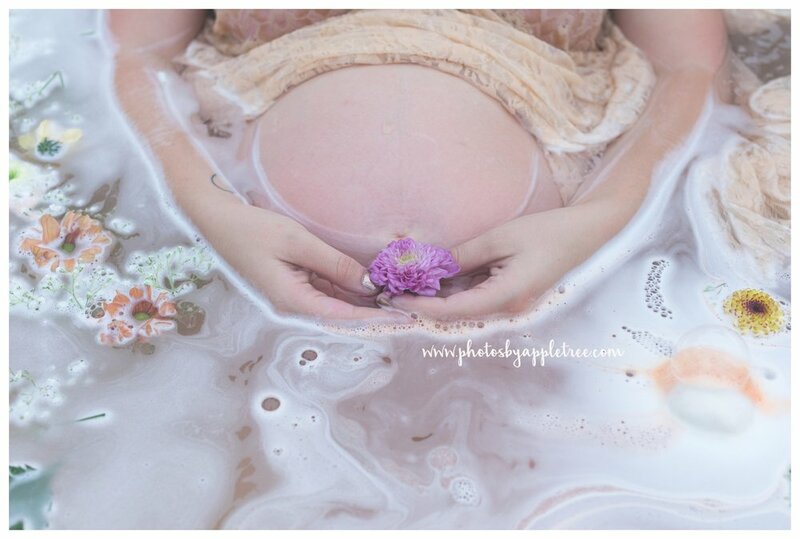 I am excited to say this is the month I will be honored to capture the birth of Victoria's rainbow baby. My other birth this month is also a rainbow child. In nature double rainbows are rare. Most of us get so excited when we see this, the most extraordinary feat that nature has created. In the case of rainbow babies, it means there has been sadness and loss for my families, but that these children are the hope for a baby soon to be realized. It's funny how the internet can connect people. Victoria and I met via facebook and began to chat mostly through a babies group when her second and my fourth were babies. She surprised me by telling me she was my #1 fan and that she knew she wanted me to capture her next birth, this unexpected compliment surprised me & gave me the warm fuzzies. A rainbow of flowers for Victoria's sweet baby. This little man made me work tonight at his two year old photoshoot! He is on the go.. go.. go! Thank goodness two year olds respond well to snack bribes! He was much easier to photograph at his birth. Well.... Much easier on me not his mom, she worked hard that day. Flashback to Micah's birth. His new big sister was stunned and slightly unimpressed to wake up to this new bundle of joy. Tags: Birthday, little boys, two! I have written and re-written this blogpost over and over again. Rearranging and deleting and reading my words time and again. I am not sure how to do my best job telling this special story. I could start the blogpost telling you how I met Dom and Micah over a year ago during their first pregnancy. I could tell you how much I enjoyed the first meeting (except the parking ticket I found after our meeting. I could tell you after I didn’t hear from them again I hoped that they had chosen to go in another direction, but I worried about the alternative, miscarriage is a sad truth in my industry. Months later I would find out this special fun couple that were so excited about their first pregnancy had sadly suffered a heartbreaking loss, Lennon was the name they chose for their unborn first child. Dom had reached out to ask me to capture the birth of Judah their son & rainbow baby. A rainbow baby is a baby born after a loss. Inspired by the idea that after a storm a rainbow comes. We do, still remember the storm and the aftermath that the family endures after a loss, but a rainbow gives us hope for the future. When Dom asked to do a rainbow milkbath with added body paint I loved and was immediately inspired by the idea. Our collaboration came to life in a most beautiful way. 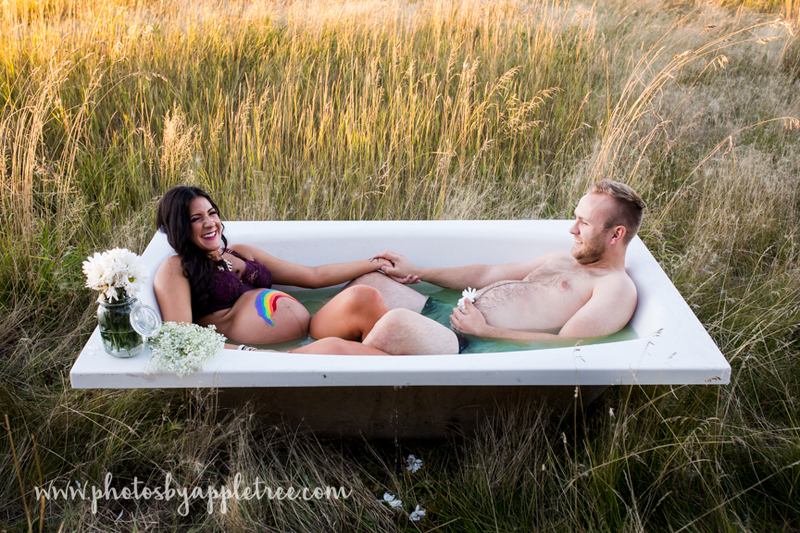 Micah was hilarious, mugging for the camera, joining Dom in her outdoor tub and when we insisted he follow ROY G BIV in order for the rainbow colors he happily complied. 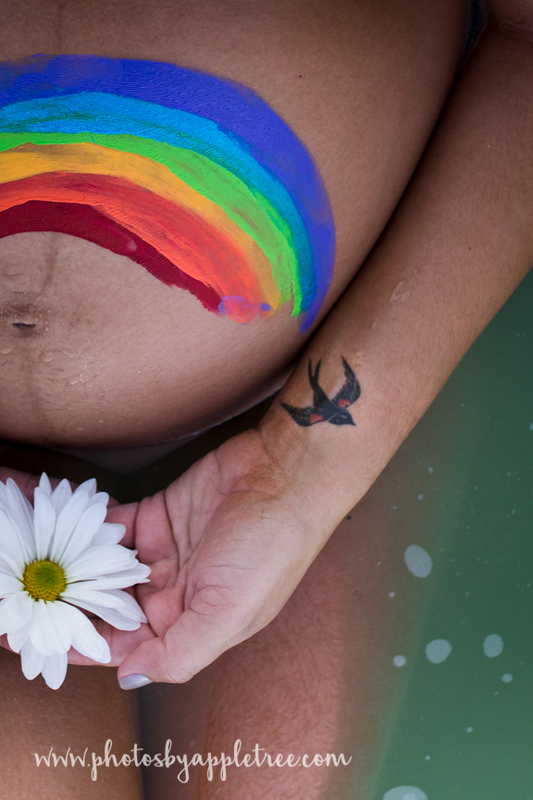 Dom shared that her wrist tattoo was created in memory of her unborn babe and I love that the little bird seems to be flying with her belly rainbow in the some of the images. I was so glad to be able to honor Lennon’s memory with this special session as we together celebrated Judah and his upcoming birth. I am anxiously awaiting meeting their boy and to be present capturing the moment of their sons birth and the surrounding power and feel the room filled with joy and remembrance. I know when I see a rainbow after a storm I take time to remember and hold space for Lennon and all of the other pregnancies that have ended in loss. The countdown is on to meet Dom & Micah's much anticipated baby boy! Enjoy tonight's short sneak peek and be sure to return and see the gorgeous RAINBOW themed milkbath images later this week. It is a great honor to be asked to capture an in home newborn session when I was also able to capture the husband and wife in the delivery room. To have witnessed the time when their newly born baby takes its first breath and they become parents in a heartbeat. It is awe inspiring for me to witness such special moments like Levi talking to his new baby and calling him Son for the first time, moments after birth. Then to hear the nickname again at home at a newborn session fills my heart. "Son" Such an emotion filled and powerful word to describe such a tiny being. Watching a Woman become a mother and after a short time learning to feed her child with such confidence and joy is one of my favorite things. The bond formed in these quiet moments when nursing help shape their relationship and nourish a child in more ways than just with food. She is teaching him that he is worthy, that she, his mother can be trusted to meet his needs. She uses the time nursing to look at his baby face, to learn the length of his eyelashes as they sweep his cheek. The sounds he makes as he eats contentedly and to memorize his sweet baby smell.